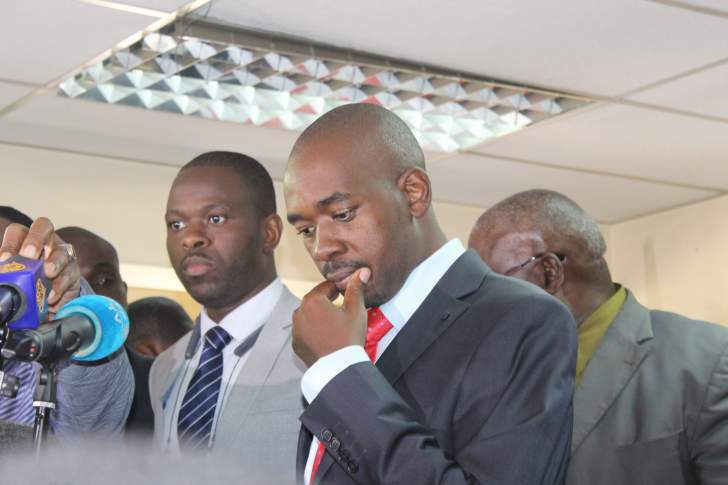 MDC Alliance leader Nelson Chamisa has described 2018 as very difficult following the death of the opposition party's founding leader Morgan Tsvangirai and a controversial election in July. Chamisa (NC) told our chief reporter Everson Mushava (EM) in an exclusive interview yesterday that he had set his sights on making an impact in the lives of Zimbabweans next year. He also insisted on talks with President Emmerson Mnangagwa, saying the disputed election was holding the country back and there was no substitute for dialogue. Below are excerpts from the interview. EM: This year you rose to become the president of the MDC and contested the watershed elections. Can you describe how 2018 was for you? NC: This was a difficult year, we lost our dear leader (Tsvangirai). We lost our icon, the founding president of the movement. Beyond that, we went into a decisive election, which we emphatically won despite the Zimbabwe Electoral Commission deciding otherwise. We went to court to seek to have the valid result announced and it was a huge set back because we expected the obvious. We anticipated the valid endorsement of the will of the people. However, that did not happen. We are in the process of defending our vote and put on the table the issue of the true will and authentic voice of the people of Zimbabwe. This is why we have put a five point plan to solve the economic ailment affecting our people. The year 2019 is decisive for the party to reverse the misfortune of Zimbabweans at various levels in their general lives. We have to put a full stop to tyranny, dictatorship and are on the path to reform, nation building and peace building. It will be a turnaround year. It is a take-off year, remedying the ailment affecting our country. It is also the year to revitalise and rejuvenate the organisation through organisational renewal and deepening of our internal democratic processes with the intention of giving effect to the party's new direction. EM: What challenges did you encounter as the leader of the MDC during an election year? NC: Filling in the shoes of a giant, to be able to take the path of an election, to move from one million votes to two million - something we should thank God for. The future is bright, people believe in the struggle. We are humbled by the support we get from across the rural, tribal and racial divide. The party is all over now. It is supported and loved. EM: What do you attribute the jump from one million votes to the two million to? NC: A number of factors, the legacy of Morgan Tsvangirai and our rural strategy. We had penetrated the rural areas, the convergence of different forces. Even former president Robert Mugabe believing in our movement [was a great boost]. Some people think it was a negative thing, but I think it is a huge advantage to be supported by someone who carries the torch of the liberation struggle. We are connecting with the liberation struggle. Our panAfrican teeth are growing. We now have a nationalistic appeal and of course, we are entrenching our dominance as a state actor. EM: Some critics say the MDC would have garnered more votes in that election had it been united. What is your reaction to that? NC: I don't think so. I feel the internal fights were inconsequential. The MDC is a massive organisation. The dynamics of such a dynamic organisation is that there are activities in it and that is what makes our democracy strong. At no point did we have internal contradictions that undermined our performance. We won this election. We did our best. We were pushing this struggle knowing that God is in it. EM: In the run-up to the recent Zanu-PF annual conference, war veterans said they wanted the minimum age for presidential election candidates to be raised from 40 to 52 years and this would have disqualified you from contesting the next election. What are your thoughts on that? NC: I talk to war veterans every time. The genuine war veterans are interested in genuine discourse that makes our country move forward. I have never doubted their commitment to a better life for all Zimbabweans and the reason why the war was waged was to give effect to the liberation agenda. It requires unanimous endorsement of the support given to universal suffrage. That was the core of the liberation struggle, and it includes the right to vote and to be voted for. In fact, we should actually reduce the presidential age limit to 18. If you are able to vote, you should also be able to be voted for. We should actually remove the presidential bar and make sure the right to vote moves with the right to be voted. All the war veterans went to war at a tender age, the likes of (vice-presidents) Constantino Chiwenga, Kembo Mohadi and Mnangagwa himself. EM: Those making such a proposal say you are not mature. What is your reaction to that? NC: What is the definition of maturity? I don't know what they are talking about. There are people who think age comes with wisdom. Others have grown old without growing up, especially in Zanu-PF. The legal age of majority was decided after several considerations. Barack Obama was leader of the United States of America at a tender age and succeeded, the same with [Emmanuel] Macron of France; they are in their prime time. If maturity is a crime associated with not being hardened in the old school of corruption and killing, then I am guilty as charged. That is not the type of politics that I believe in. Maturity is defined in the ability to give Zimbabweans a decent life. Maturity is defined by the currency your people use, the hospitals the people go to, and many other factors, but now if you look at these, I can say that most of our leaders lack maturity. Most of these old politicians are late bloomers, they are blooming in their 70s and 80s and they want everyone to wait. EM: The commission of inquiry led by former South African president Kgalema Motlanthe released its report last week and accused the MDC Alliance of planning the August 1 protests. What is your comment on those findings? NC: The Motlanthe findings were not backed by any fact. You don't say an organisation has organised protests when it has structures and you don't cite any reason why the decision was made. Who in the MDC and how did they organise the protests and with what intention? It is hard to understand the warped reasoning behind the report. It has no factual basis. It's a bold and wild conclusion without underpinning evidence. We have organised demonstrations before and at the MDC, we don't organise demonstrations that way. There was no need to organise the demonstration, we had won emphatically. Winners don't demonstrate, they celebrate. EM: The commission recommended dialogue, but recently Mnangagwa said he would not negotiate with losers. NC: Mnangagwa should not negotiate with himself because he was the loser in the elections. He does not understand that there is nothing that can beat dialogue - this is what separates humans from other animals. EM: Zanu-PF say you want dialogue because you are desperate for an inclusive government. NC: That can only come from those who do not understand. Dialogue does not mean inclusive government. The nation is divided and in different perspectives, how do we reconcile our view points? How do we deal with national discourse? We are already in government by virtue of our control of councils, we are already a government at a local level. We are not driven by love of power, but the love of our country, love of peace, our people, resources, and the love for each other. Power is meaningless if it is not serving countrymen. EM: Some say you must give Mnangagwa a chance. Is it something you have considered? NC: It is not about individuals, it is about the will of the people. We have a crisis in government. It is the crisis of legitimacy. The results announced do not reflect the will of the people. We cannot have political stability without economic stability and vice-versa.